Filled with large, bright blooms, this basket is the perfect way to fill your recipient's day with joy! 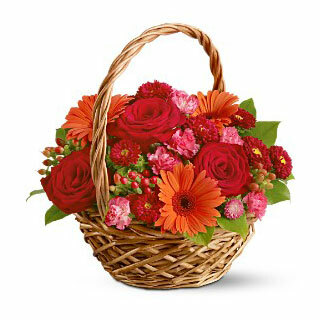 Your arrangement will include roses, gerberas, carnations and other vivid seasonal flowers in a lovely keepsake wicker basket. The contemporary color combination makes this gift basket ideal for any celebratory occasion.